The energy infrastructure company got to work after its merger fell apart. Here's a closer look at its three best moves this year. When its merger with Energy Transfer Equity was on the brink of collapse, Williams warned investors that it would need to cut its dividend by a material amount if the deal did not close. That is just what happened, with the company announcing a 68.8% reduction shortly after the deal imploded. However, the method of the reduction was surprisingly smart, with Williams choosing to reinvest the excess cash to support its MLP Williams Partners (NYSE:WPZ) by acquiring additional units in a distribution reinvestment program (DRIP). Doing so would enable Williams Partners to maintain its lucrative payout because its parent would provide it with some of the cash it needed to fund growth capex. If everything goes according to plan, both Williams and Williams Partners expect to be in the position to start growing their respective payouts in 2018. That has the potential to drive accelerated income growth at Williams, which by that time will own a much larger stake in its MLP. Further, this agreement will enable Williams Partners to fund its considerable growth pipeline while at the same time pushing leverage below 4.5 times debt-to-EBITDA by 2018, which should allow the company to maintain an investment-grade credit rating. Aside from the merger drama, another reason why Williams' stock price has been so volatile this year is due to some variability in its MLP's cash flow. While 93% of the gross margin at Williams Partners comes from fee-based assets, the other 7% has become a concern due to the significant decline in commodity prices. To address the situation, the company decided to sell its Canadian assets to reduce exposure to NGL and Olefins prices. That decision ultimately led to a sale of those assets for slightly more than $1 billion, so the transaction not only reduced commodity price exposure but brought in much-needed cash. Williams Partners' share of the proceeds was $839 million, which it used to fund growth capex and pay down debt. Meanwhile, Williams' share was $220 million, which it used to purchase additional units in its MLP to provide even more support for its growth program. Sticking with that same theme, Williams announced that it was taking another step away from cash flow variability by launching a process to monetize its Geismar Olefins plant. It is exploring a range of options, including an outright sale as well as signing a long-term, fee-based service agreement. Either way, once that process is complete, the company will have taken another step toward a future focused on generating stable fee-based cash flow. In fact, the combination of these asset monetizations as well as the company's continued investment to build new fee-based assets puts Williams into the position where it expects 97% of its gross margin to come from fee-based sources going forward. That represents one of the highest rates among large energy infrastructure companies. Williams Companies not only quickly crafted a new way forward after its deal with Energy Transfer Partners fell through, but it came up with a plan that efficiently addressed all its issues. The structure of its dividend reduction is particularly noteworthy because it could turn into an important value creator for investors in the future given that Williams will own a much larger stake in what should be an even stronger MLP. 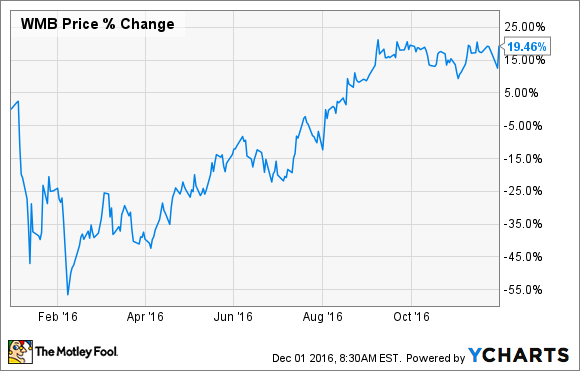 Suffice it to say; Williams Companies made several smart moves this year that positions it to grow in 2017 and beyond.